The trumpets of fame, when they are loud enough, are sometimes heard even in Lincoln. Of course many good actors come and go in the east whom we never hear of out here. But almost everyone has heard of Olga Nethersole , the young English actress who has made the New York critics revile each other and call each other uncomplimentary names. One week ago last Monday night Miss Nethersole appeared in "Camille," and the wheezy old fish horns of fame set up set such a clatter that the echo has reached us even here. "Camille" is to the modern drama what "Romeo and Juliet" is to the older; it is the test which mercilessly and unerringly divides talent from genius. Miss Nethersole is of a nation which is not productive of great tragediennes. Her nationality is heavily, heavily against her. She comes from a country that is shut out from the sun's face all the year around by clinging clouds of wet mist. A country where society is entirely formal, where coldness is esteemed a virtue among women, and where demonstrativeness is almost a crime. It may be highly to Miss Nethersole's credit that she "is an Englishman," but it is certainly a disadvantage to her art. However, nationality is not always fatal. It influences and limits physique, character, temperament, talent—everything but genius. If Miss Nethersole can either rise above or sink below the conventional standards of her country's art, she is indeed a great actress. I have noted with pleasure that in one thing all her critics are unanimous in lavish and enthusiastic praise of her first act. They say that in abandon, in recklessness, in the touch of pitiful bravado which characterizes Bohemia, in the true demi monde idea of Dumas , in the hundred details of that first act she is unsurpassed. If Miss Nethersole is really powerful, realistic, original in that first act, she has genius, and God has been very good to the English stage. In her case that act is the crucial test even more than the more powerful ones which follow. Any woman with great talent, great feeling and great earnestness could not fail to be moving in the third and fourth acts. After the first act Camille is a woman, like other women who loves. But if Miss Nethersole can play the Camille of the first act, can overcome her traditions, nationality, instincts, and be thoroughly and entirely a French coquet and a woman of the demi monde of Paris, then she has the ability to take unto herself the spirit of all times and lands, the power to "live in all lives that are and love in all loves that be." Let us hope that in this instance the critics are right, that Miss Nethersole is all this, and that the world is richer by one genius more, for with all its splendor and magnificence this world would be very poor were it not for the memory of its great. One of the amusing features of literary Lincoln is the "exclusiveness" of some of the private libraries. There are quite a number of educated and seemingly cultured people who are fortunate enough to possess large libraries and who boast that among all their books there is not one novel. Now, back in the days of the Puritan papas of Plymouth that condition of things may have indicated culture, but at present it savors very much of narrowness and pedantry. It is almost laughable in this century, when the best talent has almost all gone into the novel, that people should be ashamed to put Meredith or Balzac on their book shelves. It seems that illustrated books are considered frivolous and that ponderous volumes with formidable bindings and uncut edges and paper labels are the correct thing. Libraries should be only exhibition rooms filled with matter to impress the beholder with the rigid intellectuality of the family. As a rule these people, like their libraries, have more prose and poetry in their lives and they are generally unillustrated, in very formidable bindings, with rough and uncut edges and paper labels of a very assertive character. Yet many of these same people, who talk like the data of ethics, who dance like the origin of species, who wear their hats in a holy Roman empire sort of way, will go down to the city library and draw out the works of Mary J. Holmes and Augusta J. Evans and read them with gusto and delight. Town Topics is fond of discovering anything new, from scandals down. Its latest discovery is a poet, presumably a female, one with the suggestive nom de plume of Bliss Carmen . 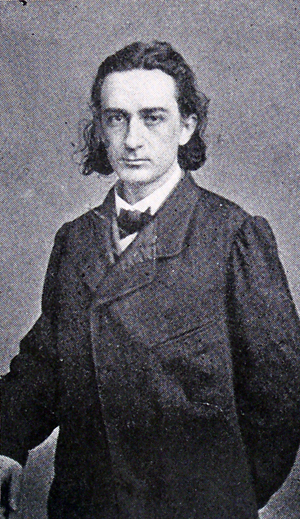 In a lengthy and enthusiastic review of this poet's works, the "Journal of Society" neglects to say whether it is to a man or woman that the world owes the seraphic and sapphic productions called "Songs of the Sea Children." Here is one of them: I was the west wind over the garden, Out of the twilit marve and deep: You were the sultry langourous flower, Famished and filled and laid to sleep. I was the rover bee, and you— With the red-hot mouth where a soul might drown, And the buoyant soul where a man might swim— You were the blossom that sucked me down. This is certainly very wonderful poetry, but there are a few incongruities. In the first place we object to a mouth where anything could drown, and our souls at least would not care to be fluttering about a mouth of such proportions. Even Clara Morris' mouth is not so bad as that. The next line is still more wonderful. Poets, long ere this, have been bathed in smiles and laved in tears, but swimming in souls is a privilege which has hitherto been denied erring humanity. Of all the malicious and contemptible slanders that have emanated from the clergy, one of the most disgraceful was set afloat in Sioux City last Sunday by Rev. D. Jenkins of that city. Pauline Hall was billed to appear there that night in "Dorcas," and the reverend doctor, who objected to Sunday amusement, set out to prevent her. 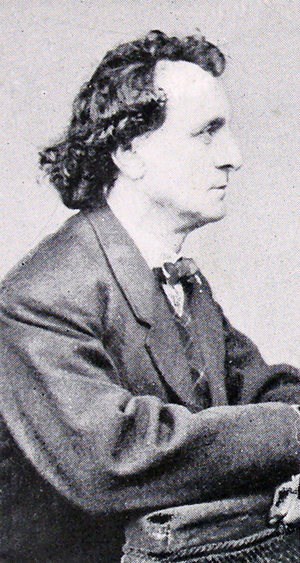 When everything else failed he resorted to the press and published an article in which he stated that "the character of Pauline Hall is such as to prevent respectable women from associating with or meeting her in a social way, and she certainly is not a woman that men should go to see at a Sunday performance. I take it that the show is of the 'Black Crook' order, as she belongs to the gang." Of course the assault was as ineffectual as it was cowardly and the only result was that there was not standing room in the theatre that night. Just where the reverend doctor got his information concerning Miss Hall's character it is hard to say. The world and the profession have always considered her one of the best and kindest little women who ever made blue people merry. 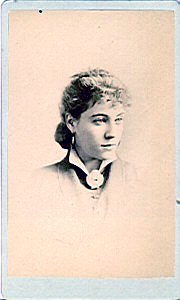 Socially and artistically Miss Hall has been noted for her delicacy of speech and charm of manner. The most sensational newspapers, the blackest blackmailing sheets have never dared to utter a word against her character. It was left for a minister of the gospel to do that. It is strange that this minister should know objectionable things about Miss Hall which other people do not. If her reputation and honor were not above question and suspicion, this divine would appear in rather a bad light. This is the second time this year that the pulpit has been disgraced by men who fill it unworthily. The first time it was by a gentleman who had, as he supposed, Mrs. Potter and Mr. Bellew in his church and proceeded to publicly insult them. Fortunately the supposed stars were only a couple of specialty people who had respect enough for their calling to get up and leave the church in the midst of the minister's tirade. But in so far as the minister was concerned, the assault was just as coarse and just as brutal as though Mrs. Potter had been before him. If she had indeed been there, it would have been a great opportunity for a good minister, and he would have prayed before he entered his pulpit that morning, prayed that there might be given to him some word, some look whose tenderness should melt through the stony defiance which this woman had wrapped about her against the world. He might not have changed her, but he might have touched her, and it would have been much to have brought back one holy thought to a mind that had forgotten holy things. Instead of this, he arose, one miserable human puppet, one contemptible, sinning man, and tried to revoke Christ's edict of salvation, tried to scourge this sinning woman from the sanctuary which the Son of God died to build for sin. And yet this man calls himself a follower of Christ, of the Christ who wandered the length and breadth of Palestine to find one soul who had lost its way, never heeding the ninety and nine circumspect sheep who lay demurely in the fold. And all this recalls what an emotional actress, who is considered better as an artist than a woman, said as she was hurridly dressing for her next act one night when a visitor who happened to present laughed a little at the silver crucifix which hung around her neck: "Yes," she said simply, "I go to church because I need the church more than other women who are better than I, and I am a Catholic because the Catholic church is the only church into which one can take sin." And it has been always. Whatever else the Church of Rome has been, or has not been, it has never been afraid of evil. It has not stood back and watched the fray; it has gone right to the front where the battle is fought and has offered hope and comfort to those who had got the worst of it. Rome knows humanity so well. It has forgiven so many sins through so many centuries; it has heard the confessions of kings and peasants and montebanks, and it knows so well how wicked and miserable humanity really is. It has been cruel, but it has also been tender; it has deceived, but it has also comforted. 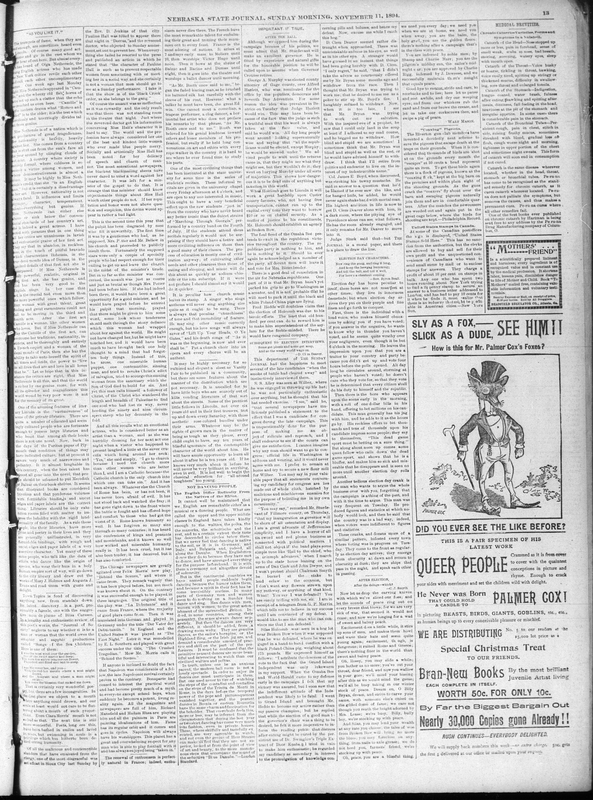 The Chicago newspapers are greatly agitated over Felix Morris' new play, "Behind the Scenes," and where it came from. They remark vaguely that it has been played before, but not much was known about it. On the contrary it was successful enough to be played in three languages. The original title of the play was "La Debutante" and it came from France, where the majority of good plays come from. Then it was translated into German and played in Germany under the title "Der Vater der Debuetantin." In England and the United States it was played as "The First Night." Later it was remodelled by E. L. Southern and played with great success under the title, "The Crushed Tragedian." Mow Mr. Morris calls it "Behind the Scenes." If anyone is inclined to doubt the fact that Napolean was considerable of a fellow, the late Napoleonic revival certainly proves to the contrary. Bonaparte had ceased to interest the practical world and had become pretty much of a myth to everyone except school boys, when suddenly he becomes a potent, living reality again. All the magazines and newspapers are full of him, Richard Mansfield and Madam Rhea are playing him and all the painters in Paris are painting idealizations of him. Fame has its regular orbit and it comes and goes in cycles. Napoleon will always have his worshippers. This planet has a great and overwhelming respect for any man who is able to play football with it and has always enjoyed being "taken in." The renewal of enthusiasm is perfectly natural in France; indeed enthusiasm never dies there. The French have the most remarkable talent for embalming their great and trotting their mummies out to every feast. France is the most adoring of nations. It arises at 7 and says early mass to Moliere until 10, then worships Victor Hugo until noon. Then it bows at the shrine of Balzac and Racine and Dumas until night, then it goes into the theatre and worships a ballet dancer until morning. "As Mr. Booth once said to me," began the faded leacing man, as he brushed his battered silk hat carefully with the sleeve of his coat. Heavens! what talker he must have been, the great Edwin. One cannot meet a comedian, a trapeze performer, a clog dancer, a horizontal bar artist who does not preface his remarks by that phrase, "As Mr. Booth once said to me." Booth was beloved for his genial kindness toward others and lesser members of his profession, but really if he held long conversations on art and ethics with every rope walker in the country it is hard to see where he ever found time to study his parts. One of the most civilizing things that has been instituted at the state university for some time is the series of student's recitals. These informal recitals are given in the university chapel every Friday afternoon at 4 o'clock, and are open to any one interested in music. This ought to have a very beneficial effect upon the raw students "just in" from the country who have never heard any better music than the dulcet strains of "Marching Through Georgia" performed by a country band on the Fourth of July. If the students attend these recitals regularly it would not be surprising if they should have a better and more civilizing influence on them than a good many of their classes. The process of education is mostly one of civilization anyway; of cultivating other needs and other pleasures than those of eating and sleeping, and music will do this about as quickly as sodium chloride or the iota subscript. If it were not profane I should almost say it would do it quicker. It is peculiar how church music leaves its stamp. A singer who sings anthems will never sing anything else quite as it ought to be sung. There is always that peculiar "churchiness" of tone and that immobility of feature. He may sing other music correctly enough, but his love songs will always savor of "Lift Up Your Heads, O Ye Gates," and his death songs of "As it was in the beginning, is now and ever shall be." Put a church choir into an opera and every chorus will be an anthent. It may be highly necessary for so cultured and elegant a sheet as Vanity Fair to be published in a community, but there are some features about the manner of the distribution which are not necessary. It is uncalled for to have little boys who are scarcely out of kilts vending literature of that sort about the streets. Some of the prettiest little fellows in Lincoln, not over six years old and in their first trousers, trot up and down every Saturday with those aesthetic rose-colored bundles under their arms. Whatever may be the rights of grown men in the matter of being as tough as they please, every child ought to have, say ten years of blissful ignorance of the contemptible character of the world about him. He will have ample opportunity to learn all about it after he is ten years old. If he knows very much about it before he will never be very brilliant in anything, even in evil. It is not well to begin the classical education for "all around toughness" too young. trumpets of fame: In medieval iconography, Eolus, the ruler of the winds, is shown blowing two trumpets at the behest of Fame; sometimes one is the trumpet of false or worldly fame and the other is the trumpet of honest fame. wheezy old fish horns of fame: Chaucer represents the sea-god Poseidon's son and messenger, Triton, who blew on a twisted conch-shell, as the servant who carries the trumpets of Fame for Eolus. He is an Englishman! For he himself has said it, And it's greatly to his credit, That he is an Englishman! Puritan papas of Plymouth: The first settlers of New England founded Plymouth Plantation in 1620. Balzac: Honoré de Balzac (1799-1850) was a French journalist and writer, and is associated with the Realist movement. During his career, he wrote enough material for 90 novels and novellas that featured more than 2,000 characters and focused on the traditions, atmosphere, and habits of bourgeois France. Holy Roman Empire: Charlemagne was crowned as the first Holy Roman Emperor in 800 AD. The territory it encompassed, over much of central and western Europe, fluctuated as did the power of the emperors. Long before the last emperor, Francis II, gave up the title in 1806, the empire and the emperor had become largely symbolic. In the eighteenth century Voltaire said of it that it was "neither holy, nor Roman, nor an empire." Mary Jane Hawes Holmes: Mary Jane Hawes Holmes (1825-1907) was born in Massachusetts and showed her talent for writing early, with her first publication at the age of fifteen. Her first novel was published in 1854. She began writing for Street and Smith's New York Weekly in 1859, and the success of her first serial, Marian Grey, is said to have saved the paper from bankruptcy; she contributed twenty-seven serials to the Weekly and was paid as much as $5000 for one. She went on to write many popular, highly emotional novels, such as Lena Rivers (made into movies in 1914, 1925, and 1932), and Tempest and Sunshine (made into movies in 1914 and 1916). Augusta J. Evans: Augusta Jane Evans Wilson (1835-1909) was born in Alabama; she was devoted to the Confederate cause, writing propaganda articles for the Mobile, Alabama, papers in 1859 and a novel, Macaria, that was said to have been smuggled into the north and distributed to Union troops in order to disaffect them from the Union cause. 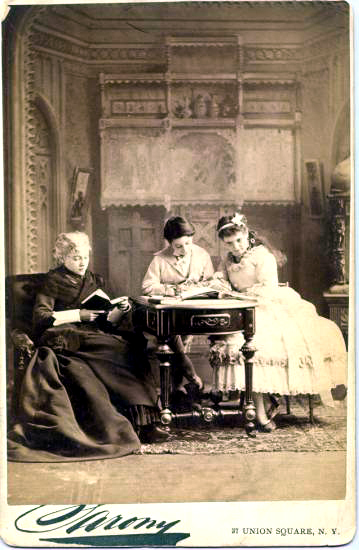 The most famous of her nine popular novels were Inez, Beulah, Infelice, and St. Elmo (1867). Town Topics: In 1891, Col. Wiliam d'Alton Mann purchased a New York weekly paper called Town Topics and subtitled "The Journal of Society," turning it into one of the most prominent scandal sheets in the country. Mann employed spies and tipsters from the fringes of society; the paper would publish scurrilous items without using names (to avoid libel suits), then follow the paragraph with an innocuous report of a wedding or trip or party involving the names of the parties in the previous item. He developed a lucrative blackmail business among those who could pay to have gossip items suppressed; he was not exposed until 1906, when Emily and Edwin Post set up a sting when Mann tried to blackmail Post. It is unclear how much those outside Mann's circle knew of his practices. Bliss Carmen: William Bliss Carman (1861-1929) was born in New Brunswick, a descendant of Loyalists who emigrated from the U.S. after the American Revolution. He was educated in New Burnswick, Edinburgh, Harvard, and New York, where he became an editor and writer for various literary journals, including the Chap Book. His Low Tide on Grand Pré was published in 1893; he became well-known as a poet with Songs from Vagabondia, with Richard Hovey, in 1894, and many other books thereafter. Much of his poetry focuses on nature, but from a variety of spiritual perspectives over the course of his life. Songs of the Sea Children: These love poems were inspired by Bliss Carman's relationship with Jessie Kappeler, whom he met in Washington, D.C. in 1892. The volume, Songs of the Sea Children, with 121 poems plus a prelude and "aftersong," was not published until 1904. I was the west wind...: "I was the west wind" is number 50 of Bliss Carman's Songs of the Sea Children, as it was published in 1904. Sioux City: Sioux City, in northwest Iowa, lies along the Missouri River, about ninety miles north of Omaha, Nebraska. The town was platted in 1854, and named for the Sioux River, which flows into the Missouri nearby; it soon became an important commercial center—its stockyards were important into the latter half of the twentieth century. Two adjacent towns are South Sioux City, Nebraska, and North Sioux City, South Dakota. Rev. D. Jenkins: The Rev. Dr. Hermon D. Jenkins (1840-c.1907) was pastor of the First Presbyterian Church of Sioux City from 1889 to 1894-95, when Pauline Hall's light opera company visited the town. According to the New York Times (6 January 1895, p. 1), he had published a letter associating Hall with the notorious "Black Crook" production; after Hall's husband threatened to file civil and criminal charges, Jenkins gave him a letter of retraction. 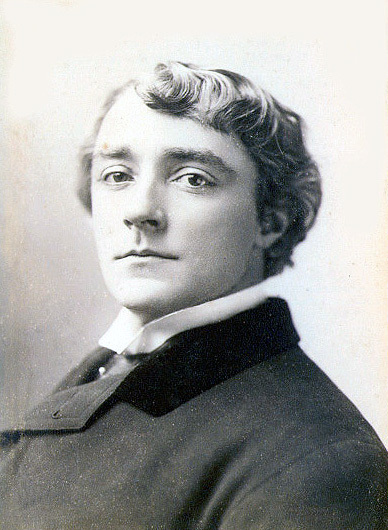 According to a later report, Jenkins denied having written a letter attacking any particular member of the theatrical profession and denied ever having made an apology or retraction (New York Times, 16 January 1895, p. 9). Jenkins received his Doctor of Divinity degree from Beloit College in 1881; he served pastorates in Joliet and Freeport, Ill., before coming to Sioux City, and went on to serve in Kansas City (1895-1900) and Chicago (1901-1907). Dorcas: Dorcas, an operetta (or "operatic comedy," as it was sometimes described), was written by Harry and Edward Paulton and produced in 1894. Pauline Hall toured with it for several years, as did a few other companies. Sunday amusement: Strong feelings about keeping the Sabbath among members of many Protestant denominations led to local ordnances forbidding such things as organized baseball games and theatrical performances on Sunday. The Black Crook: Often called the first American musical, The Black Crook opened at Niblo's Garden in New York in September 1866. It was the most expensive production of its day (sources give figures from $25,000 to $50,000), the most successful (it ran for over a year and earned over $1,000,000), and the most scandalous (for its scantily-clad chorus of a hundred French ballet girls). The Black Crook began as a melodrama by Charles Barras (1826-1873) about a crook-backed practitioner of black magic, Hertzog, who conspires with the demon Zamiel to steal the soul of the poor painter Rodolphe, who loves the beautiful foundling Aminta. When the theater in which a troupe of French ballerinas was to perform burned down, the managers offered the dancers, with their costumes and scenery, to William Wheatley, the producer of the Barras play. A libretto based on the play incorporated music, dances, and dazzling scenic effects; the show lasted for more than five hours. The Black Crook had been revived eight times in New York, most recently at the Academy of Music from September 1, 1892 to May 20, 1894, when it ran for 306 performances and took in over $350,000. Agnes deMille choreographed a revival in 1929. Other companies revived it all over the country for the rest of the century, and it was made into a film in 1916. The Black Crook in Lincoln in April 1894 was not that of the New York revival, which starred Morris Lipman, Charles Plunkett, Grace Tabor, and Louise Freeman. Image of the Black Crook chorus available at the New York Public Library Digital Gallery. Christ's edict of salvation: In the Bible, in Luke 7, the sinful woman comes to anoint Jesus' feet; the Pharisees murmur at this, saying that Jesus should have known what she was and sent her away. Instead Jesus tells her her sins are forgiven and "Thy faith hath saved thee; go in peace." ninety and nine circumspect sheep: In the Bible, in Matthew 18:12, and also in Luke 15:4, Jesus tells the parable of the shepherd with one hundred sheep who goes in search of the one lost one, leaving the other ninety-nine in the pasture. Luke makes the lesson explicit: "I say unto you, that likewise joy shall be in heaven over one sinner that repenteth, more than over ninety and nine just persons, which need no repentance." In The Song of the Lark Thea sings the popular hymn, "The Ninety and Nine" (1874) based on this passage; the words were by Elizabeth Clephane and music by Ira D. Sankey. The hymn is also alluded to in Cather's short story, "The Joy of Nellie Deane." emotional actress...better as an artist than as a woman:: This actress, presumably one of the ones who had visited Lincoln earlier in the year, has not been identified. 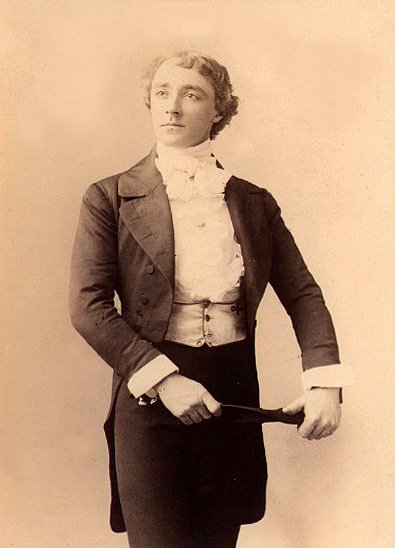 Felix Morris: Actor Felix Morris (1845-1900) was born in England and studied medicine before deciding to pursue a career on the stage. He came to the U.S., supporting himself occasionally as a drugstore clerk. He became a member of Eugene McDowell's and George Fawcett Rowe's companies in the 1870s, touring in the U.S. and Canada. 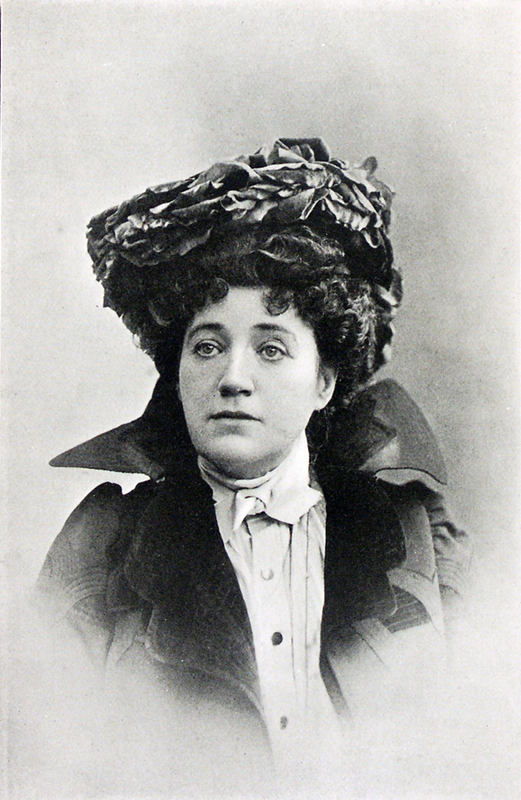 In the 1880s he formed his own touring company, adapting plays such as Mona(1885) for actress Helene Dauvray, and The Pavements of Paris(1884), starring himself. By 1890, however, he was a member of Rosina Vokes' London Comedy Company. After her death in early 1894 he formed his own company again, writing and adapting plays, such as The Old Musician(1891). Morris's Reminiscences was published in 1892. He married actress Florence Wood and had two daughters, Mildred and Felice. 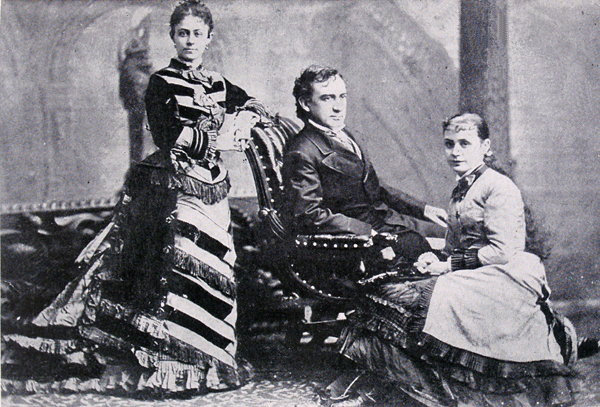 Behind the Scenes: Felix Morris's adaptation of a French play, Le Père de la debutante opened in New York at Col. Sinn's Brooklyn Park Theatre on 26 February 1895. Morris played Achille Dufard. 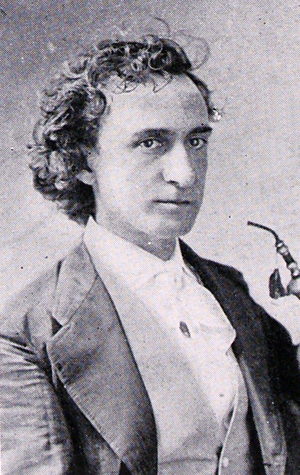 The play was still in his company's repertoire when he died in 1900. La Debutante: The French play on which Behind the Scenes was based was Le Père de la debutante (1837) by Emmanuel Théaulon (1787-1841) and Jean-François Bayard. One of Sarah Bernhardt's early performances was in this play in 1863. Der Vater der Debuetantin: This German translation or adaptation of Théaulon and Bayard's Le Père de la debutante (1837) was made by Bernhard Anton Hermann and performed in Berlin in 1848. Edward A. Sothern: British actor Edward A. Sothern (1826-1881) was born in Liverpool and went on stage first as an amateur. 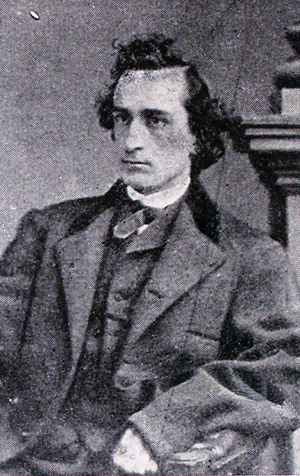 He toured in companies in Britain and the U.S. under the name Douglas Stewart until the late 1850s, when he joined Laura Keen's company in New York. 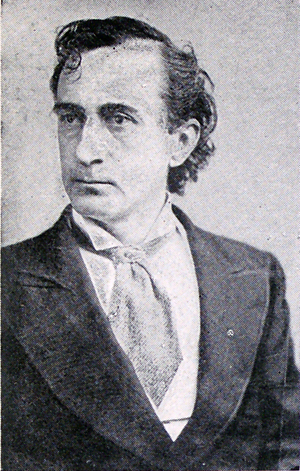 There he was given the minor role of the lisping, dim-witted Lord Dundreary in Tom Taylor's Our American Cousin (1858), with Joseph Jefferson in the leading role as Asa Trenchard. When he complained about the part, Jefferson is supposed to have given him the famous advice, "there are no small parts, only small actors." Sothern added bits of business and even lines, and made a hit, eventually making Dundreary the center of the play, and spawning spin-off plays featuring the character. The long side whiskers Sothern wore in the role became a popular fashion for men under the name of "dundrearies." His success assured, Sothern divided his time between the U.S. and Britain until a year or so before his death. 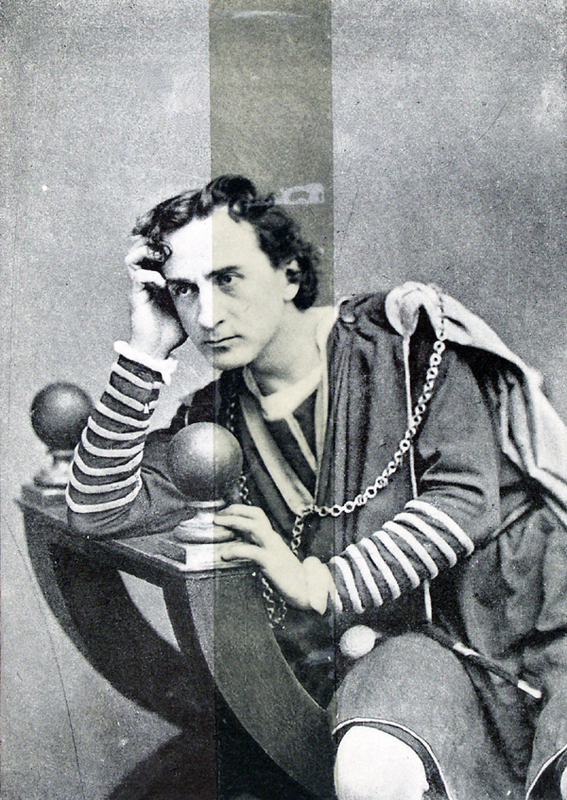 Sothern had a daughter, Eva, who made her debut in 1880, and three sons who became actors; his second son, Edward Hugh (E.H.) Sothern (1859-1933), became a popular Shakespearian actor in the U.S. 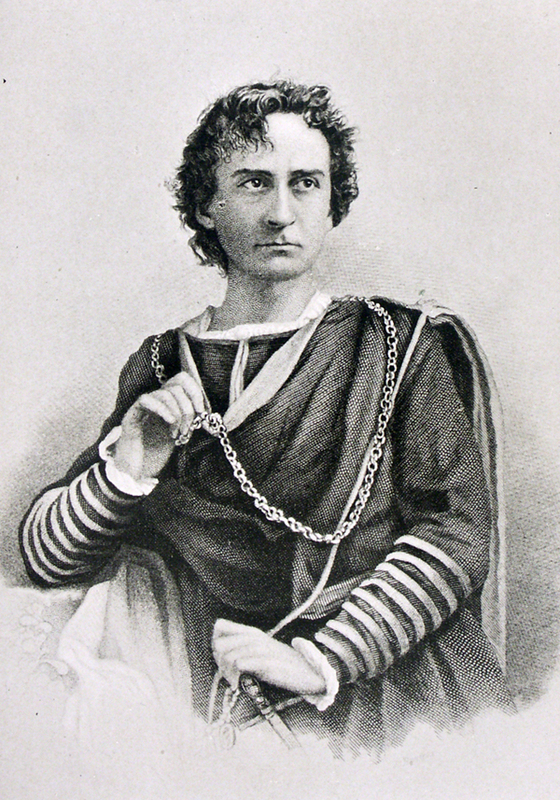 The Crushed Tragedian: British actor-playwright H. J. Byron first played DeLacey Fitzaltomont in The Prompter's Box: A Story of the Footlights and Fireside; he revised the play for actor E. A. Sothern as A Crushed Tragedian. The New York Times obituary of E. A. Sothern noted that he played Fritz Altamont in The Crushed Tragedian in New York for the first time in 1877, saying "he gave dignity and even pathos to a most absurd and dilapidated individual who aspires to histrionic heights" (22 January 1881). Napoleon I: Napoleon Bonaparte (1769-1821) was born in Corsica. He joined the French army as a lieutenant in the artillery in 1785. As the French Revolution got under way, Bonaparte supported the Jacobins, and began his rise in rank: in 1793 he became a brigadier general for the defeat of the British at Toulon. In 1795 he became commander of the armies of the interior for defeating the rebels against the National Convention, then commander in chief of the Army of Italy in 1796. His victories against the Italians and Austrians, and then his conquest of Egypt led to his appointment as first consul, master of France at the age of 30. He made lasting legal, governmental, financial, and educational reforms, and had himself crowned emperor in 1804. However, he was determined to expand the borders and hegemony of France, leading to renewed war with the British and the disastrous attack on Russia in 1812. By 1814 Napoleon's empire, and his support in France itself, was crumbling, and he was forced to abdicate. Exiled to the island of Elba, he seized a time of instability to return, rallying his soldiers to him until his final defeat by the British and Prussians at Waterloo. Thereafter he was exiled to the island of St. Helena in the south Atlantic, where he died. late Napoleonic revival: Americans admired Napoleon as the embodiment of the self-made man. 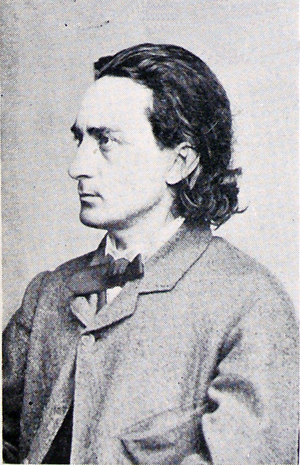 European biographies and memoirs were translated and published in the U.S. but from the middle of the nineteenth century American writers and historians such as J.T. Headley, John S.C. Abbott, and John S. Roper, issued works on Napoleon that were widely read. Cather may be referring specifically to the biography of Napoleon by Ida Tarbell which was running as a serial in McClure's Magazine in 1894. William M. Sloane's authoritative biography was serialized in the Century Magazine in 1895 and 1896. Mlle. 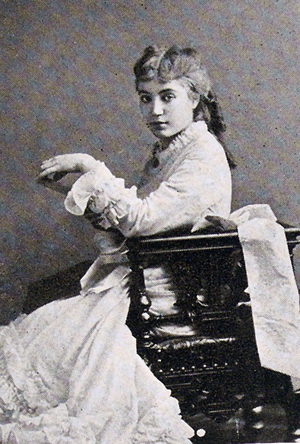 Rhea: French actress Hortense-Berbe Loret (1843-1899) was born in Belgium. She began her dramatic career at the age of twenty, playing chiefly in Europe and Russia. 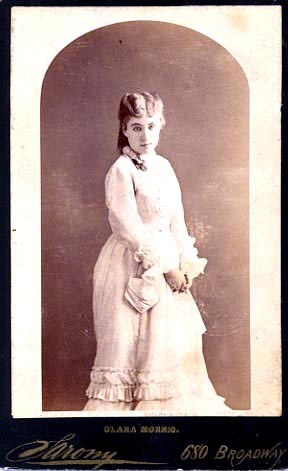 She made her London debut in 1881 and then came to New York in November 1881. She never scored a great success in that city, but she was popular in the rest of the U.S. for many years; in 1893-94 she toured with a new play, The Queen of Sheba, with W. S. Hart as Hiram. Victor Hugo: French writer and political activist Victor Hugo (1802-1885) made his name first as a poet in the early 1820s. Inspired by the French Romantic writer Chateaubriand, he called for the breaking of the bonds of the French classical tradition: this led to the so-called "battle of Hernani," the riot that followed the production of his play, Hernani, in 1830. His poetry, plays, and novels made him the leading writer of his day. His novel, Notre Dame de Paris (1831), published in English as The Hunchback of Notre Dame, won him fame throughout Europe; Les Miserables (1862) embodied his social concerns. Racine: Seventeenth-century French playwright Jean Racine (1639-1699) orphaned young and educated in the classics at Port-Royal, a school with ties to the Jansenists who sought reform in the Catholic church. His poetry was praised by the great critic, Boileau, who encouraged Racine to come to Paris. La Thébaïde (1664), his first play to be performed, was produced by Molière's company, but Racine's bent was towards tragedy, and he angered Molière by going to another company to produce his next play. Many of his greatest plays were on classical themes (Andromache, Iphigenia, Phaedra), and he was admired for the classical simplicity of his style. Bring the good old bugle, boys, we'll sing another song	Sing it with a spirit that will start the world along	Sing it as we used to sing it, 50,000 strong	While we were marching through Georgia. Hurrah! Hurrah! we bring the jubilee! Hurrah! Hurrah! the flag that makes you free! So we sang the chorus from Atlanta to the sea	While we were marching through Georgia. sodium chloride: Sodium chloride is common table salt, NaCl. Sodium was was discovered by Sir Humphrey Davy in 1807; chlorine, which does not appear free in nature, was isolated in 1774 by C. W. Scheele, but recognized as an element and named by Davy in 1810.
iota subscript: In later Greek orthography, the letter iota is written as a subscript (a vertical line) under a vowel to indicate a long vowel diphthong. In ancient Greek the letter had been included in the word, but as pronunciation and orthography changed, it was dropped, then reintroduced by Byzantine scholars in copies of older texts. Lift Up Your Heads, O Ye Gates: In the Bible, Psalm 24:7 reads, "Lift up your heads, O ye gates; and be ye lift up, ye everlasting doors; and the King of glory shall come in." Handel used lines these lines as the basis for "Lift Up Your Heads, O Ye Gates," number 33 in The Messiah. As it was in the beginning . . .: In the Bible, the last lines of Psalm 125 read, "Glory to the Father, and to the Son, and to the Holy Spirit: as it was in the beginning, is now, and will be for ever. Amen." The lines have been used in various church liturgies. Vanity Fair: This Vanity Fair was a society, arts, and scandal newspaper published in Lincoln, Nebraska, in the late 1880s and early 1890s. scarcely out of kilts: Boys and girls were dressed alike in long, then short dresses for the first few years. Queen Victoria's fondness for Scottish plaids and costume led to the popularity of kilts for very young boys, as a form of masculine dress before boys were put in short pants, at about the ages of five to seven, although this could vary. Boys graduated to long pants about the age of twelve or so.